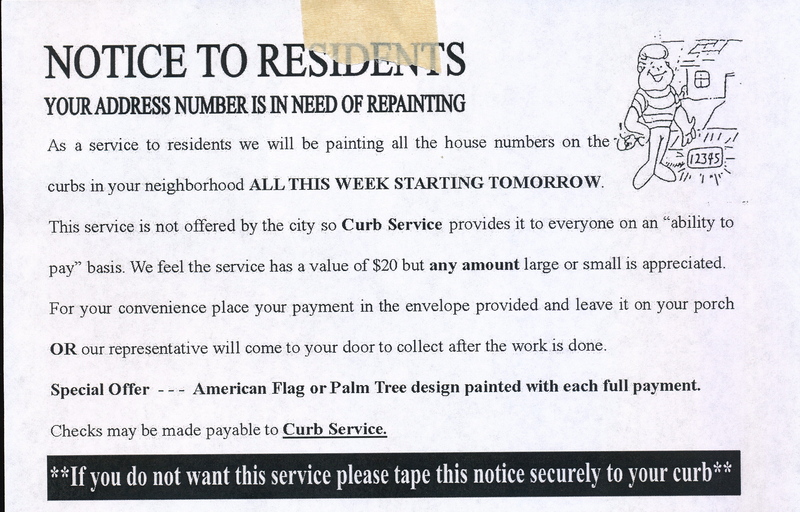 One of the stranger and smaller (yet widespread) scams going around is getting one of these notices taped to your front door announcing that somebody will paint your curbside house number unless you instruct them not to. The “company” placing these calls itself “Curb Service” but offers no license, no registration, no business address, no contact information. They are also asking a homeowner to pay for what is, legally, public property, not maintained by the homeowner, the curb of the street. It is a form of blackmail. They do a service which they are not hired for. And then ask you to pay for it when it is done. As an out they say you can tape this notice to your curb to prevent address number painting. Like public strangers picking through private trash and recyclables, it is illegal. Imagine Lido’s Restaurant taping a menu to your door and announcing that they were going to deliver a pizza to your house every Sunday night unless you told them not to? “who would pay $20.00 for such a triffling–though important–product.” If it’s important, why would paying $20 for it be shocking? Presumably lots of people wouldn’t mind. However, I disagree with the opt out approach, obviously. In my, non-Van Nuys neighborhood, it’s opt in (put notice out if you want the service), and I guess the price varies by location, because the going rate is $35 here. For the opt out approach, presumably you owe these folks nothing if they paint the numbers and then want some cash. jobs program” everyone wants the City to create for teenagers. And who would pay $20.00 for such a triffling–though important–product. to paint their “block numbers” on their roofs for the LAPD helicopters to see. Who (or what entity) painted the curb numbers from the beginning? Should it not fall under the Dept. of Street Services?